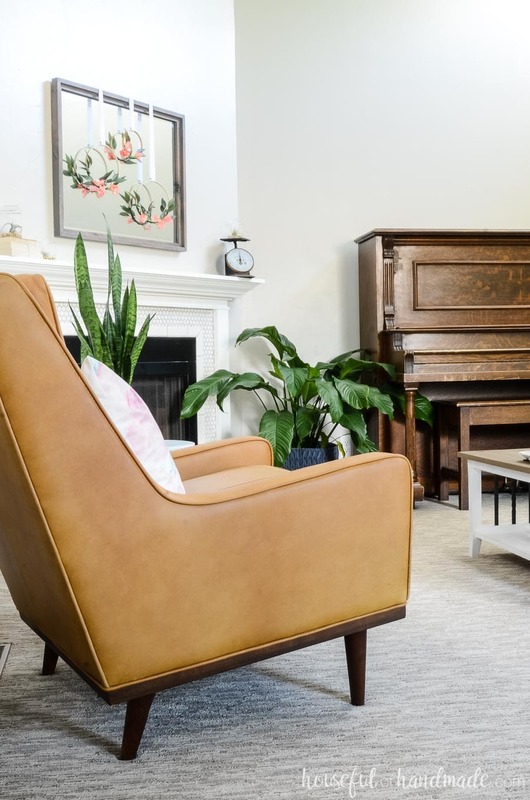 Give your home new life with a living room refresh this spring. 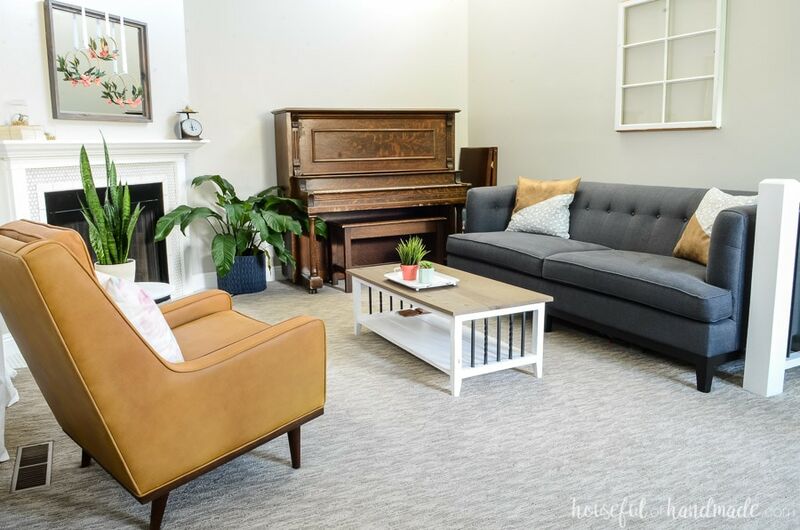 A few key pieces in a new space can make it feel fresh and new. It’s the perfect way to fall in love with your home again. Spring is the perfect time of the year to do a refresh of your home. Last year we updated our living room with fresh paint, new carpet and a new sofa, but that is where we left it. I wanted a new chair for the space but was having the hardest time finding the perfect chair. Not anymore! 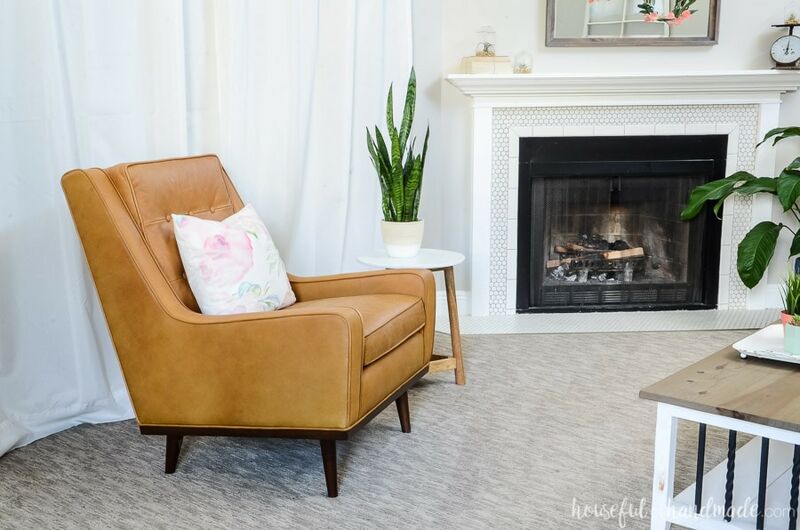 This spring I partnered with Article to find the perfect chair for our space and force me to finally finish our living room refresh. I have always struggled with furniture in our living room. The space is long and narrow, with an angled fireplace in one corner. Then there are stairs to worry about and a weird nook by the window. We have separated the room into 2 areas to help with the long room. On the small side by the stairs we have my husbands desk, aka: his office. And on the other side of the stairs is the sitting area. This is where we gather and chat. I love that there is no TV in the space. Just a place for conversation. Because of the narrow room, I needed a small chair to fit the space. But I didn’t want to sacrifice style, quality or comfort! The old rocking chair we had in the space was just too large and the kids would bang it into the walls all the time. Then I found Article. They have tons of beautiful, high-quality furniture that is all delivered for only $49! They also have two additional delivery option upgrades available. I immediately grabbed my measuring tape and was super excited to discover their original, modern furniture would be a perfect fit in my space. It was quite hard deciding on just one chair for our space. There were so many chairs that I liked and that would fit perfectly in our space at such great price points. Since we already had a grayish-navy sofa, I wanted something more neutral to accompany it. The white and gray and ivory chairs were all so beautiful, but my husband fell in love with the Nina Charme Tan leather armchair. It is a bit more masculine than some of the chairs I was leaning towards, but the lines were simple and the tufting was right up my alley. And of course it was the perfect size for our small living room. I am a huge fan of leather furniture, especially in a room that gets a lot of use. Leather really holds up well, even with kids around! 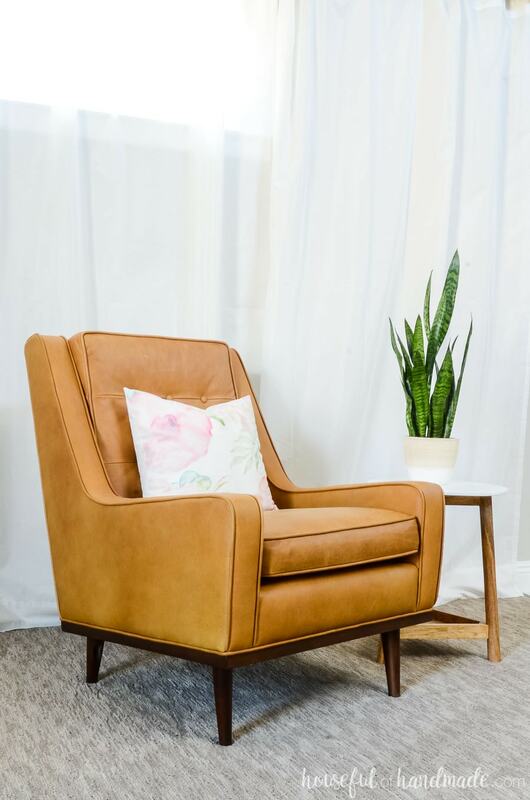 And since the Nina armchair is a great affordable leather chair, I gave in to my husband and ordered it for our living room refresh. Best part is, we were able to shop for it in our pjs! 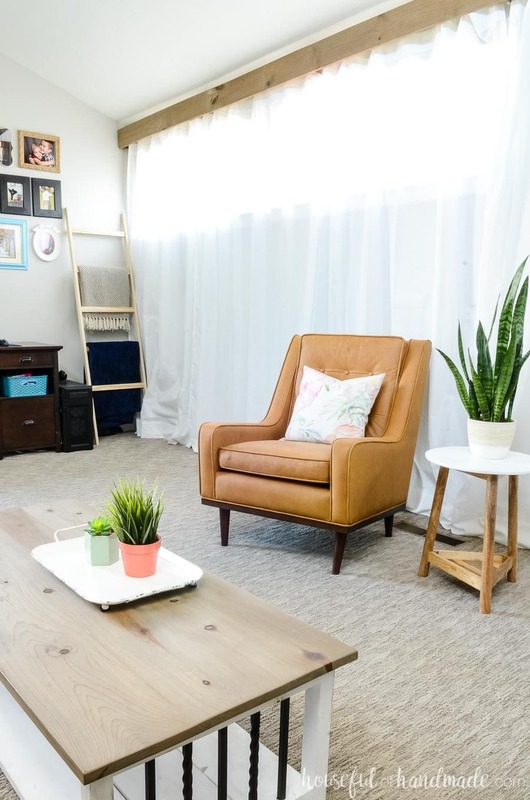 Decorating a small space doesn’t mean you have to give up on comfort either. My husband is in love with our new Nina armchair. Even though it is a smaller profile chair, it is so comfortable. The quality of this chair is amazing. They designed it so you sit slightly reclined. At first you think it might be weird, but when you nestle into the chair you realize how genius it is. And the tan leather is so soft, almost suede like. This is our new favorite spot to enjoy our morning coffee. Add 1 or 2 new pieces. You do not need to replace all the furniture in a space to make it look new. Find a couple pieces in your budget that will work with the pieces you already have. Paint. A fresh coat of paint makes everything new again. 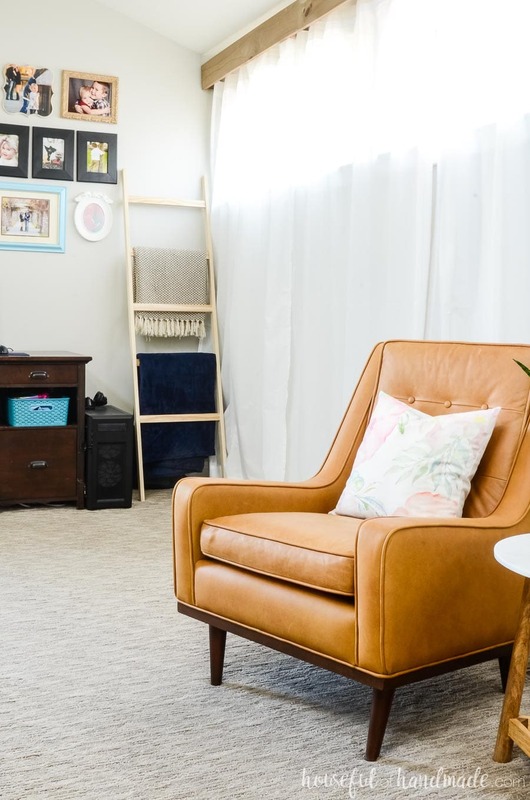 Whether it’s new paint on the walls or updating a piece of furniture with paint, you will love how easy it is to make something beautiful again. Add texture. Pillows, blankets, and more can really refresh a space. Add a light throw to a space for spring, with bright new throw pillows. Or go cozy with a warm throw and knitted pillows in the fall. Rearrange your accessories. Sometimes you don’t even need to go shopping to refresh your space. You can “shop” your home and rearrange the accessories and decor pieces you already have. Add greenery. Plants are a great way to refresh a space. You can add cut flowers or potted plants. And if you don’t have a green thumb, there are so many beautiful faux plants out there that no one will ever know. To complete our living room refresh, we added some more plants and new pillows for spring. I love switching out pillows regularly because it makes a room feel brand new again. And the soft watercolor print on the masculine armchair is the perfect balance of me and the hubby! I also added some leather details to our sofa with pillows. It’s a great balance and really ties in the new chair beautifully. 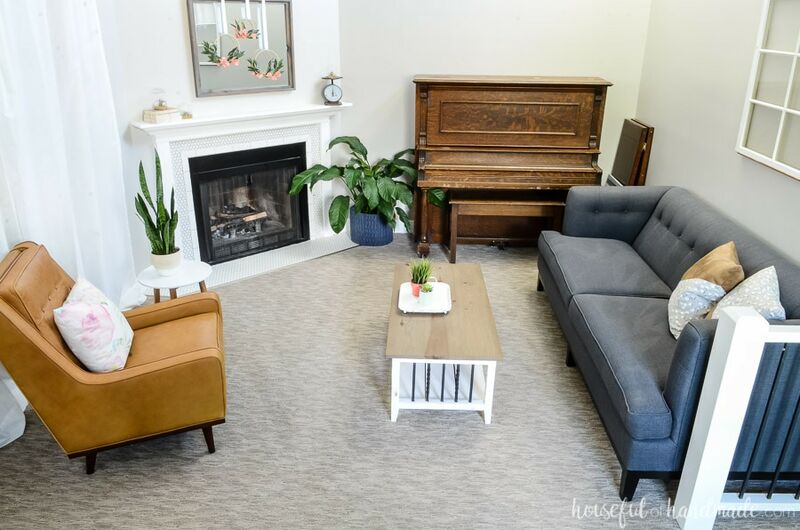 I love how we were able to complete our living room refresh so easily and on budget with Article. I’ve got my eye on some other pieces from them. 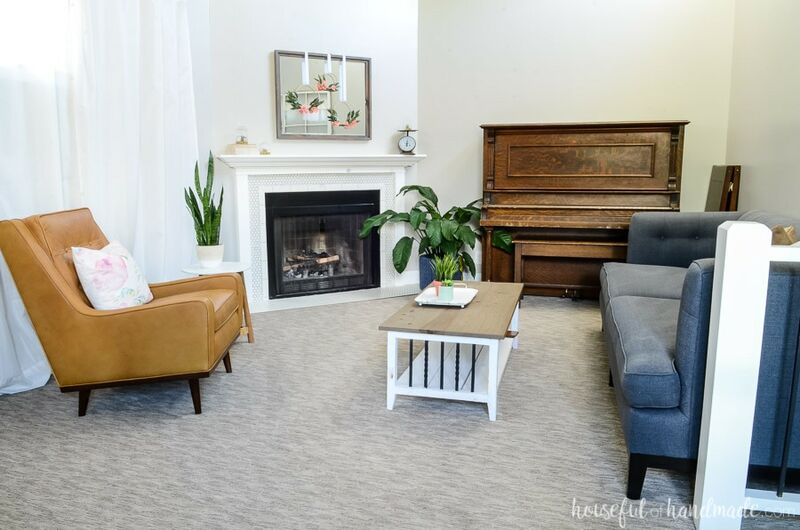 With their huge Memorial Day Sale going on, maybe next I’ll work on a TV room refresh too! 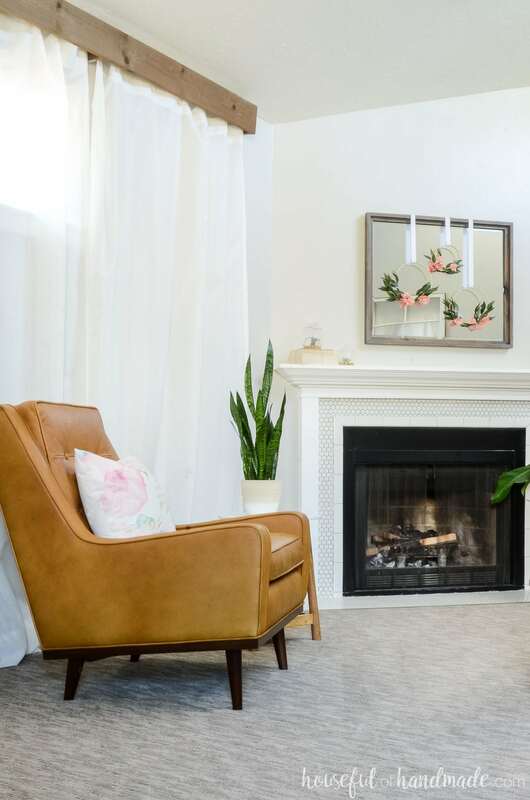 Tell us about those “three floral hoops” on the mirror over the fireplace! Love them! Those floral hoops were created with a couple faux floral stems I bought at Hobby Lobby and some embroidery hoops. I just wired them on the hoops and them hung them with a little grosgrain ribbon. So simple, but perfect for spring! That chair is beautiful! Love the color. Thanks Margie! The color is so perfect and it is so comfy. Best chair ever. Pair it with a nice ottoman and I could take a most comfortable nap. You don’t even need the ottoman! Such a great chair.